Last edited by .seVered. ][; 06-08-2013 at 06:08 PM. It's possible that I may do something more serious usable online and worldwide (hence being done in PHP), but I actually already used it myself to check if a package had the right dependencies once for example. It could be used by anyone with some PHP/SQL knowledge to build an online package database with dependencies, statistics and whatnot about mods and maps, then perhaps a gadget could go along with it for direct communication... idk... the possibilities are endless. Last edited by Feralidragon; 06-07-2013 at 06:31 AM. Ya, it was uber easy to make this, but I'd like to see something cool form someone who really knows how to do this well. Hint Hint. That's pretty nice. When you click it does it just show server info? Actually, it has different embedd links... I can pull up stats for ANY player (that is online at that moment), my stats, server stats, and .... uhm Oh yes, PLAY (join). it's just the HTTP Embedded code form the GameTracker website... almost LITERALLY copied into my gadget. LOL, I knew you would see that>.. THAT my dear is a secret... I'll show you someday..
Last edited by .seVered. ][; 06-08-2013 at 05:45 PM. 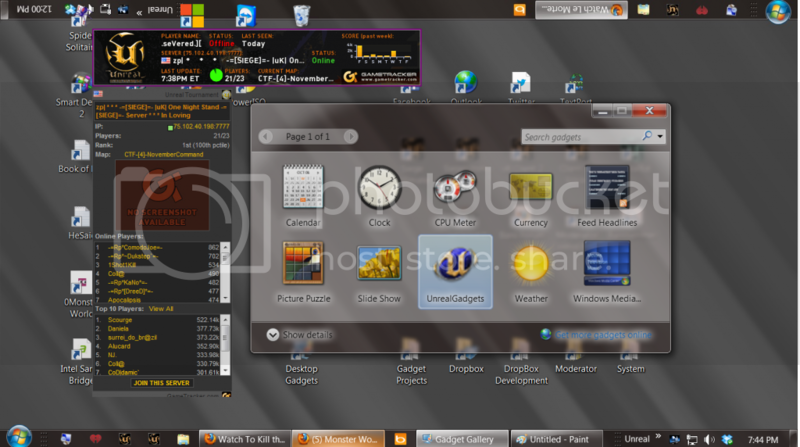 lmao upside down taskbar? da fuq? I updated the First post and added a copy in the Tutorials Forum.. figured it belonged there anyways.